Do these tweets sound familiar? "Avoid driving in the area" - "Residents may experience low water pressure" - "Under boil advisory"
Based on the Water Industry Database for all types of pipe, there are 0.27 water main breaks per mile of pipe per year, which equates to 237,600 water main breaks in the United States annually (Kirmeyer, Richards, and Smith, 1994). 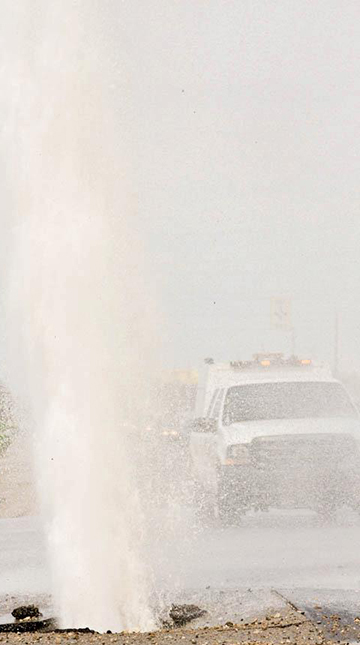 Why do water mains leak or break? In our experience, temperature, the age of the pipe, material composition, and soil conditions can be factors in why water mains leak or break. High System Pressures. Closing a system valve too quickly can raise the water pressure in a pipe and cause water hammer, which causes leaks at joints in the pipe or even pipe failure. Also, excessive pumping of water can change the hydraulic conditions of the system and cause leaks or breaks; this often occurs in the summertime when the demand for water is high. Cold Temperatures. Cold weather can force frost deeper into the soil, which can cause the ground to shift and buried pipes to move or dislodge. The older the pipes, the more susceptible they are to breaking under these forces. Winter months in Indiana often result in a frequent cycle of freezing/thawing which influences ground movement and the likelihood of a joint to leak or a pipe to break. Natural Phenomenon. Earthquakes and landslides, which cause the ground to move, may also cause water mains to break. Corrosion. Acidic soil conditions and the water carried inside the pipe may corrode the pipe over time. This is most common with water mains made of iron and steel. How do you know if you have a water main leak or break? Water main leaks and breaks are most often detected from observations of water at the ground surface. However, unexplained drops in pressure or increases in flow may also be a good indication a leak or break may be present. Performing a water loss audit of a distribution system is beneficial for maintaining safe drinking water for your customers and for identifying locations of breaks or leaks to reduce loss of revenue for the water utility. High-tech programs and software are now used to assist utilities with water loss detection and revenue deficits. The AWWA manual M36 provides information and guidance on water loss audits. Why should you replace leaking or broken water mains? The cost of losing treated water is expensive. Every day 850 water main breaks occur in North America at a total annual repair cost of over $3 billion. Water utilities endure this cost as well as equipment expenses, water shortages, traffic delays, and a loss of productivity. What should I consider when replacing broken water mains? Replace old wooden, transite (asbestos), steel-jacketed concrete, and cast iron pipes with ductile iron, polyvinyl chloride (PVC), and/or high density polyethylene (HDPE) water main pipe. Add harmless corrosion inhibitors to the water prior to distribution, which can reduce the tendency of the water to corrode the pipe interior. Add polyethylene encasement or cathodic protection during the construction of new ductile iron water mains to prevent or minimize metal loss resulting from corrosive soils. Install corrosion-resistant joint gaskets for pipe joints susceptible to corrosive soil conditions. Rehabilitate structurally-sound, aging cast iron water mains by adding an interior cement lining or cured-in-place-pipe (CIPP) product. Install water mains at the appropriate depth in the ground as required per 327 Indiana Administrative Code 8-3.2-17(d). Coordinate replacement or rehabilitation of broken water mains with other road or underground work in the same area to reduce costs. If you have aging, deteriorating water mains in your system, consider rehabilitating or replacing them to prevent unnecessary water loss and unexpected water main breaks. This will help ensure the distribution of safe drinking water to customers and provide an accurate source of revenue for your water utility.